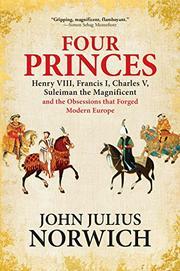 In the decades after 1500, four energetic rulers jockeyed for pre-eminence in a turbulent Europe. In fact, their energy and Europe’s turbulence were nothing new, but they were fascinating figures: France’s King Francis I, England’s King Henry VIII, the Holy Roman Emperor Charles V, and Suleiman the Magnificent, leader of the Ottoman Empire. British polymath, TV personality, and historian Norwich (Sicily: An Island at the Crossroads of History, 2015, etc.) delivers lively biographies of all four characters. All of them reigned long and died in their beds. Neither overly intelligent nor humane, they promoted the well-being of their subjects if it didn’t interfere with their personal desires. The most powerful was Suleiman the Magnificent. Though an “outsider” and the sole non-Christian, he shared their aims: expanding his realm through a bankrupting series of wars, persecuting dissenting sects, and killing rivals. His main European opponent, Charles V, ruled the Spanish and Holy Roman empires and had designs on Italy, which were shared by France’s Francis I. Preferring power to faith, Francis had no objection to cooperating with Suleiman, which outraged Christian Europe without bringing much benefit. Henry VIII preferred fighting England’s traditional enemy, France. His religious quarrels are well-known, but Norwich emphasizes that Henry always considered himself a good Catholic. His fight with the pope was personal; he wanted a divorce, and then he wanted money from dissolving the monasteries. Scholars consider all four effective rulers, yet they were also cruel, selfish, and grotesquely macho. The author labels them men of their times, but it’s likely that awfulness comes naturally to rulers with absolute power (readers can think of many recent examples). Bad behavior makes for entertaining history, and age has not diminished Norwich’s skills, so readers may gnash their teeth but will continue to turn the pages.